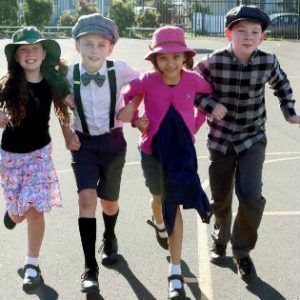 The weekend of May 20 marked the 60th anniversary of the opening of Stella Maris Primary School Shellharbour. Sr M. Regina, known to us now as Sr Kathleen Munce RSC, was the inaugural Principal followed by several other RSCs and concluding with Sr Colleen Mills who handed over to the first Lay Principal four years ago. On Sunday, May 20 Srs Kerry Barrass, Colleen Mills, Jean Montgomery, Margaret Valentine, and Margaret Fitzgerald participated in the 9 am parish Eucharist in All Saints Church that included a homily and prayers celebrating this significant event. Following the Mass, more than 200 people enjoyed a BBQ in the school grounds, tours of the school, display of memorabilia and placing of a time capsule that will be opened in 2058. The next day, Tuesday, May 22 Kerry, Anne Taylor and Margaret Beirne attended a special tribute to the Sisters of Charity and the Foundation Day Awards Assembly. 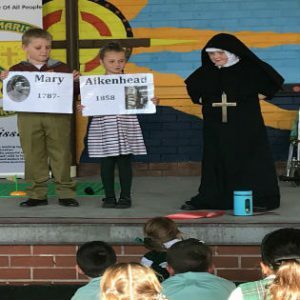 Year 2 students entertained fellow students, parents and guests with a fabulous re-enactment of our story – from Mary Aikenhead, the arrival of the first five Sisters, our ministries in education, health and pastoral care, right through to the founding of Stella Maris and up to now. After “Mary Aikenhead” (aged 7) had farewelled the five Sisters, she climbed into her wheelchair where she remained, closely observing the rest of the performance. In his enthusiasm “Archbishop Polding” waved enthusiastically to his mother (in the audience) as he arrived on the stage! Another highlight was the school choir’s rendition of The Charity of Christ and a song especially written as a tribute to the Sisters of Charity by a member of staff. It was altogether a most enjoyable and heart-warming event.